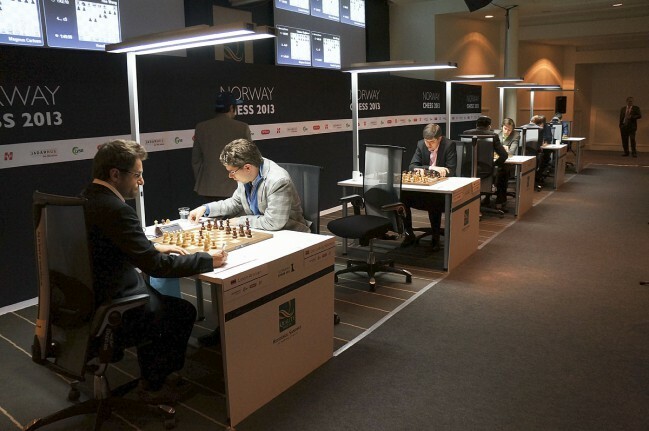 Just like in previous rounds of Norway Chess 2013, round 6 offered a lot of entertainment for the audience. We saw one pretty brutal win, one pretty boring draw, one exciting draw where none of the players ever seemed to get the upper hand, one nail biting draw where the worse side held on by the slimmest of margins and finally a totally exhausting end game squeeze where the relentless pressure eventually became too much for the defending side. In other words, Hammer lost rather brutally to Aronian, Topalov and Wang Hao played a peaceful draw, Nakamura and Svidler both stayed in control in their sharp battle, Karjakin barely saved a draw against World Chess Champion Anand and Carlsen managed to bank another full point in a long grind against Radjabov. In the first game to finish, Hammer ventured down a daring path in his Grünfeld game against Aronian, giving up a pawn in the hope that his a-passer should provide sufficient counterplay, only to realize that it simply wasn’t enough. Topalov vs Wang Hao was a Queen’s gambit where the tension in the center was resolved early with queens coming off resulted in a symmetrical pawn structure with no weaknesses in either camp. The game never became very exciting, and it finished uneventfully with a repetition and a draw on move 32. Nakamura’s Ponziani against Svidler turned into a sharp, tactical battle already in the opening, leaving the mainlines. The game was a draw. Anand vs Karjakin started rather quietly, but sharpened up as the time control approached. Anand found a way to open the h-file and was close to beating Karjakin at some point, but the game went for a draw. The last game to finish was another Carlsen vs Radjabov marathon, reminiscent of their 13th round battle in the London Candidates. The game saw yet one rather unassuming setup with white by Carlsen, with black taking on an isolani in the d-file quite early on, seemingly without any kind of problems. The isolani turned into two hanging pawns in the c- and d-file when white exchanged off his bishop for a knight on c6, and the battleground was set. However, Carlsen went for the long haul and eventually beat Radjabov.